Tweetgarden is an online, interactive installation in which participants turn private confessions and thoughts into a public artwork. Trees have been sites for people to gather and connect throughout history and mythology in cultures around the world; in Tweetgarden, watch a virtual tree grow – online and in the gallery - as participants share their thoughts, wishes and confessions. Share secrets, thoughts, confessions and wishes on twitter with the #treeconfessions tag to take part and visit tweetgarden.ca to view the project and learn more! WHAT IS THE PLACE THAT YOU CALL HOME AND WHAT ARE YOUR FAVOURITE THINGS ABOUT IT? 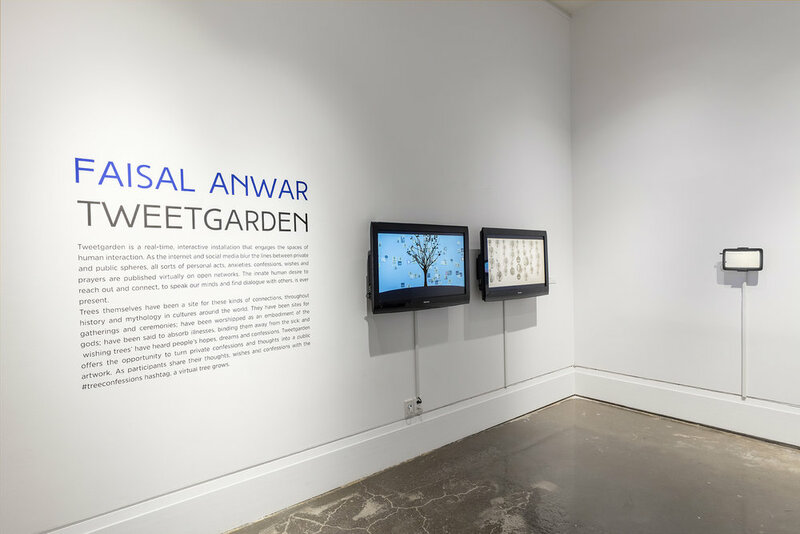 Faisal Anwar, Tweetgarden, Resource Room, Art Gallery of Mississauga. Photo by Toni Hafkenscheid.